PERFECT FOR PARTIES AND EVENTS! Make any party favor look great in this container! EASY ACCESS CUPCAKE HOLDER! With high handles and a stable holder for any regular cupcake, no hands will get messy! EXCELLENT SPACE FOR HIGH TOPPINGS, OR LOTS OF TREATS! With a height of 4 1/2" Inches you can make your cupcakes extra extravegent without having to worry about space. WINDOW FOR DISPLAYING CREATIVITY! Show off anything you put into this container by using the large window on the front of the box! BOX DIMENSIONS: 3 3/4" x 3 3/4" x 4 1/2" . 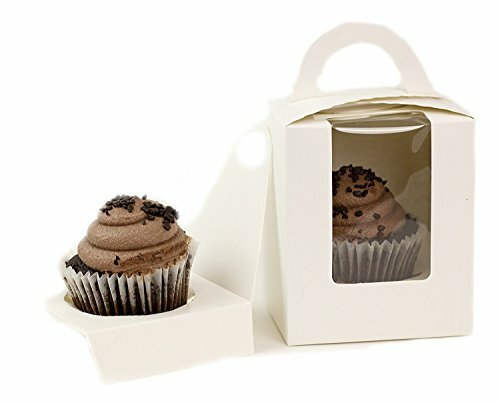 Holder can fit standard sized cupcakes with 2 - 2 1/2" base. If you have any questions about this product by Chefible®, contact us by completing and submitting the form below. If you are looking for a specif part number, please include it with your message.